Q: Where can I find information about city services? A: We’re happy to help you get all the information you need. If you can’t locate the answers on our Web site, please call City Hall at 712-336-1871. Q: Can I register my car in Spirit Lake? A: Your car must be registered through the Dickinson County Treasurer’s Office at the County Courthouse in Spirit Lake. For more information, call the Treasurer’s Office at 712-336-1205. Q: Where do I get my driver’s license? A: You may obtain your driver’s license at the Dickinson County Drivers Licensing office at the Dickinson County Courthouse each Monday through Friday from 9:00 a.m. to 1:00 p.m. and 2:00 p.m. to 4:00 p.m. For more information, call the courthouse at 712-336-6277. Q: When is trash pickup? Q: Does Spirit Lake have a recycling program? A: Recyclable materials are picked up the first and third Wednesday if you live north of 18th Street and the second and fourth Wednesday if you live south of 18th Street. Q: When can I have yard waste picked up? A: Yard waste pickup for the City of Spirit Lake is on Fridays from April through October, weather permitting. Please check the announcements page each Spring and Fall for the specific starting and ending dates for curbside pickup. Effective January 1, 2009 yard waste such as grass clippings, leaves, and brush must be placed in 30-gallon brown kraft paper bags for curbside pickup. Orange plastic bags will no longer be allowed for yard waste pickup; however, residents can use their leftover orange bags for their regular garbage and City crews will pick up the garbage filled orange bags in addition to the normal pickup of the green bags. Leaves, grass, and brush must be in the 30-gallon brown kraft paper bags and must not exceed a total weight of 40 pounds per bag. Residents can obtain these 30-gallon brown kraft paper bags from local retailers such as Bomgaars, Ace Hardware, Wal-Mart, and HyVee. Branches up to 1-inch in diameter may be bundled with twine or jute for curbside pickup also. Branch bundles may not exceed 12-inches in diameter, 4-feet in length, or exceed a weight of 40 pounds. Branches wider than 1-inch in diameter will also be picked up curbside, but must be bundled separately with other branches of similar thickness with bundles not exceeding 12-inches in diameter, 4-feet in length, and not exceed a weight of 40 pounds. Branches exceeding 5-inches in diameter will not be accepted. Q: Can I burn yard waste? A: No. Spirit Lake has a ban on open burning. If you wish to burn, you may apply for a special permit at City Hall, 712-336-1871. Q: Do I need to license my pet? A: Yes, Spirit Lake does require pet licenses. Please bring proof of rabies vaccination to the Police Department and we will be glad to issue you a license. The cost is $3 per animal.The City of Spirit Lake also has a requirement that dangerous dog owners have a special permit. This applies to pit bulls and other dogs with similar characteristics. For information on this, contact City Hall. Q: What are the Post Office hours? A: Regular business hours are 8:30 a.m. to 4:30 p.m. Monday through Friday; Saturday, 8:30 a.m. to 11:30 a.m. 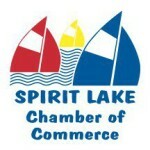 The phone number for the Spirit Lake Post Office is 712-336-1683.